The World Health Organisation (WHO) has issued a medical product alert notifying patients, pharmacists and doctors of falsified versions of Iclusig 15 mg and Iclusig 45 mg circulating across Europe and the United States. Genuine Iclusig contains Ponatinib Hydrochloride as the active pharmaceutical ingredient and it is used to treat different forms of leukaemia. The drug is priced at around £5,000 a pack in the UK in 2017. It is confirmed that the fake products do not contain Ponatinib but instead have paracetamol. The pharmaceutical companies Takeda and Incyte are the genuine manufacturers or market authorization holders for Iclusig in the regions which the above fake versions have been discovered to date. Both the companies confirmed to WHO that they did not manufacture or supply these products. Batch numbers PR072875 and 25A19E09 do not correspond to genuine manufacturing records. 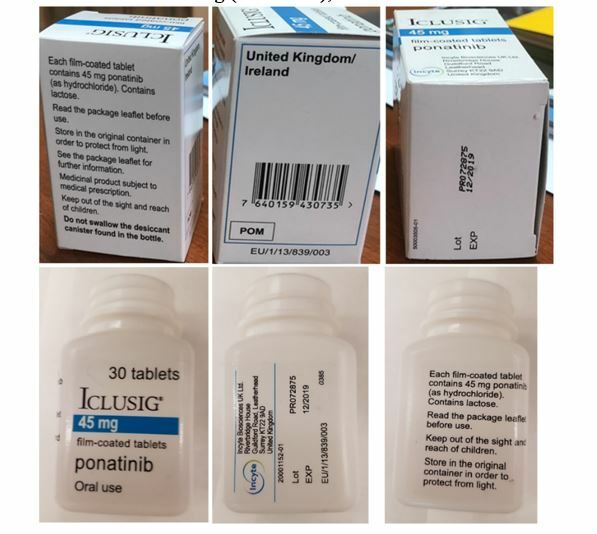 “If you have taken this falsified product, or if you suffer an adverse event or an unexpected lack of efficacy, please seek immediate advice from a qualified healthcare professional, and ensure they report the incident to your local Ministry of Health/National Medicines Regulatory Authorities/National Pharmacovigilance Centre,” WHO directed through an alert. National health authorities are asked to immediately notify WHO if these falsified products are discovered.